A 58-year-old woman underwent chest CT to monitor a colonic tumour diagnosed 1 year previously. Axial and coronal CT images showed multiple well-circumscribed pleural-based nodules in the left lower hemithorax, and the absence of the spleen in the left upper quadrant (figure 1). Routine blood work demonstrated no significant laboratory abnormality. The patient also had a history of a gunshot wound that transfixed the thoracoabdominal region 40 years previously. 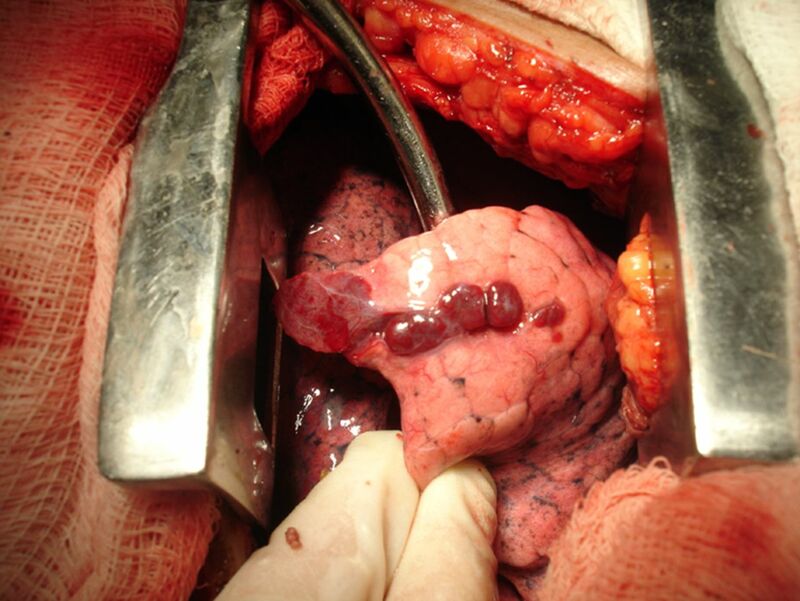 Thoracotomy was performed and disclosed multiple reddish-purple nodules on the pleural surface (figure 2). Axial (A) and coronal (B) CT images showed multiple pleural nodules in the left hemithorax and the absence of the spleen in the left upper quadrant of the abdomen. Thoracotomy disclosed multiple reddish-purple nodules on the pleural surface. What is the most probable diagnosis of the pleural nodules? Clinical and CT findings suggested a differential diagnosis between pleural metastasis and splenosis. Histopathology revealed normal splenic tissue, allowing the diagnosis of pleural splenosis. Thoracic splenosis (TS) is a benign acquired condition involving the autotransplantation of splenic tissue into the pleural cavity. It frequently results from left upper abdominal trauma with concomitant splenic damage and left diaphragmatic tear. Splenic tissue gains access to the left pleural space and derives its blood supply from the pleura, chest wall or diaphragm. TS is usually asymptomatic and found incidentally by imaging examinations performed for other reasons. It rarely causes chest pain or haemoptysis.1–5 The average interval between trauma and TS diagnosis is ∼20 years. Due to the resemblance of TS to malignancy in diagnostic imaging studies, the majority of patients have undergone extensive workups or invasive procedures.2 Differential considerations include pleural metastases, lymphoma, localised fibrous tumour of the pleura, malignant mesothelioma and invasive thymoma.3 A history of thoracoabdominal trauma and/or splenectomy and the finding of left-sided pleural-based nodules should indicate a diagnosis of TS.
. Tumorlike conditions of the pleura. Radiographics 2012;32:971–85.
. Intrathoracic splenosis presenting as persistent chest pain. J Cardiothorac Surg 2012;7:84.
. Case 93: thoracic splenosis. Radiology 2006;239:293–6.
. Noninvasive diagnosis of posttraumatic thoracic splenosis. Arch Bronconeumol 2004;40:139–40.
. CT of splenosis: patterns and pitfalls. AJR 2012;199:W686–93. Contributors MMB, RSR, MCMR and GZ designed the study. MMB, RSR, MCMR, GZ and EM analysed the samples and the data. MMB and EM wrote the manuscript, and all authors revised and checked it. Ethics approval The ethics committee/institutional review board waived the approvation.